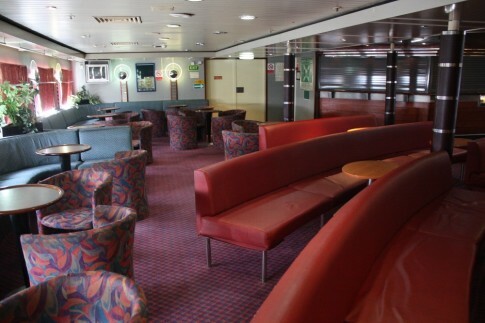 Completed in 1977, the St Columba/Stena Hibernia became something of a legend on Irish Sea services through the 1980s and into the 1990s. Finally ousted by the arrival of the first of Stena’s HSS fast ferries, she was sold for further service exactly twenty years after she had arrived, heading for Greece as the Express Aphrodite. There the vessel seemed set to become a Greek institution, perhaps lasting as long as her former Sealink cousins, the famed Milos Express (Vortigern) or Apollo Express (Senlac). The Express Aphrodite in 2005. Alas her triumphant reign on the Piraeus – Syros – Tinos – Mykonos schedule was to end earlier than many could have imagined. She latterly operated other routes for her subsequent Greek owners, Hellas Ferries/Hellenic Seaways, but was withdrawn at the end of the 2005 season, much earlier than her age and condition merited. Technical problems with the Express Santorini saw her unexpectedly return to service as cover in the Summer of 2006 but she was finally sold to Namma Lines of Saudi Arabia later that year. The ship had the bad luck to end up in the hands of HSW when they felt they no longer needed ships of this kind and, following the embarrassing bad experience of selling the Panagia Ekatontapiliani and Express Penelope to rival Greek operators who promptly put them into service against their former owners, were unwilling to sell to the many willing local buyers. 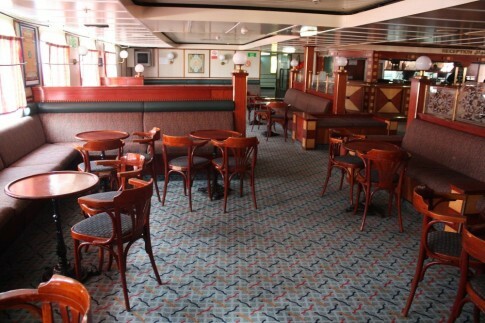 Earlier this year Richard Seville tracked the ship down in Safaga and here recounts his reunion with a ship which many believe should still be operating in Southern Europe. 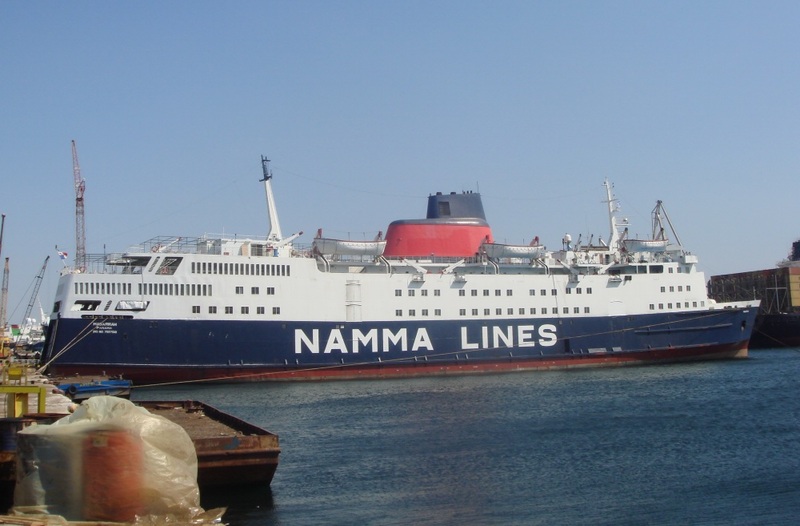 The Masarrah at Perama in April 2007 undergoing refit prior to departure for her new career. Picture courtesy Nikos Thrylos. As the Masarrah of Namma Lines, the former St Columba and Stena Hibernia is following several of her Sealink predecessors, and a number of her Irish Sea competitors, in spending her twilight years serving the pilgrim trade across the Red Sea. After essentially three incarnations under Sealink and later Stena, she was sold to Greek interests in 1997 and went on to spend a decade as a mainstay of Aegean island services. 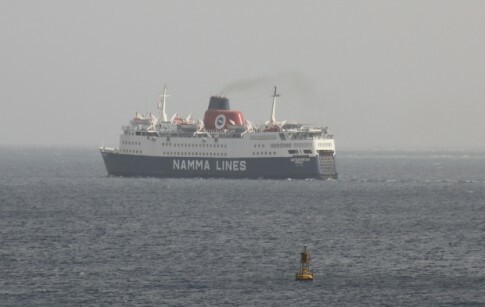 Somewhat prematurely withdrawn in 2006, she passed to the then rapidly expanding Namma Lines and after refit at Perama, entered service from both Suez and Safaga in Egypt to the Saudi port of Dhiba. In April 2009, I was able to pay a visit to the Masarrah during a turnaround period in Safaga, and her extremely welcoming Egyptian crew showed me around from top to bottom. On board, given the unfavourable reputation of these routes, maintenance standards were surprisingly good and although rather worn in places, the interior was also relatively clean and tidy. 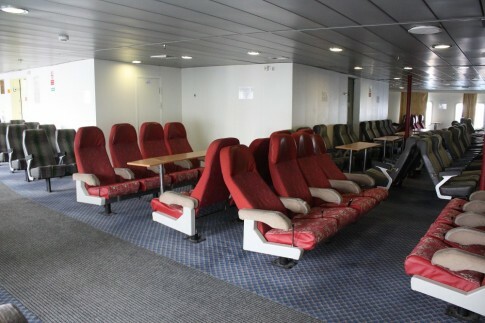 In essence, little has changed since her final Irish Sea days although her new owners have gone to the trouble of renaming all the facilities with locally relevant names as well as removing most of the references to Stena Line which had continued to remain throughout her Greek service. Key changes include the conversion of the Irish Bar into a Reception Lounge, the fitting of reclining seats in the former Pantry and duty-free shop, and the creation of a crew restaurant in the former pizzeria. I was treated with great hospitality throughout my time on board, given drinks and introduced to almost all the numerous crew as well as visiting officials. 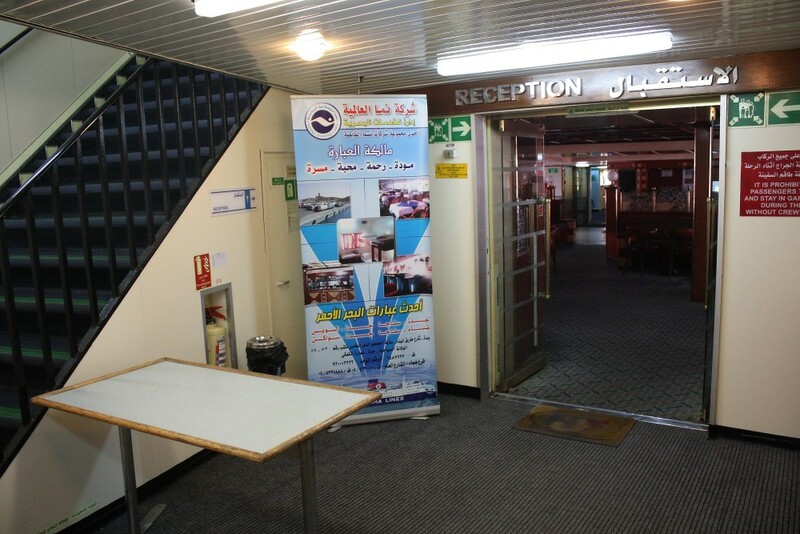 Preparations were underway for a midnight departure to Dhiba, and that evening I watched as conservatively dressed passengers loaded onto both the Masarrah and her fleetmate the, the former Superferry, which was lying alongside her. 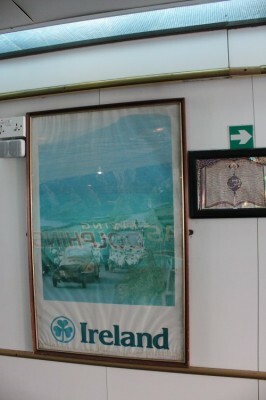 Lasting memories of the visit include a tide of blood running across the galley floor as lunch was being prepared, animatedly chatting with Egyptian officials with a faded promotional poster of Ireland as a backdrop and the tremendous hospitality shown by her crew who were astonishingly tolerant of an eccentric English enthusiast! 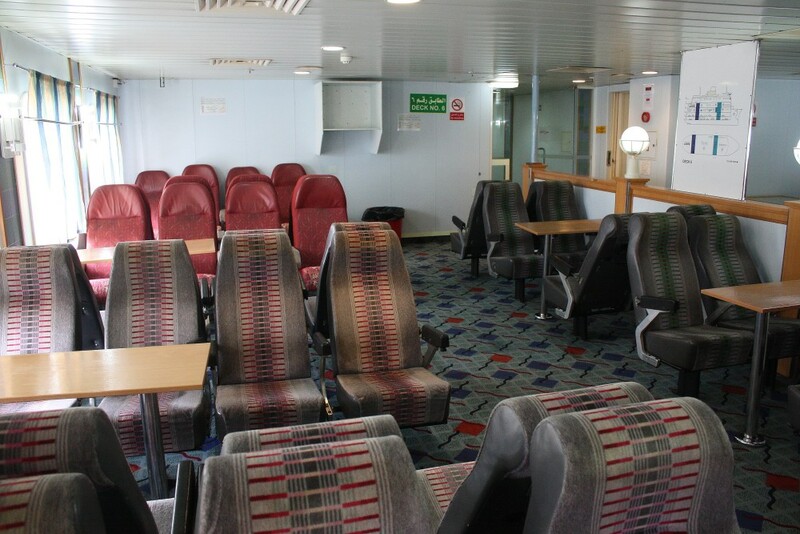 Here we present a selection of on-board views of this much loved favourite. 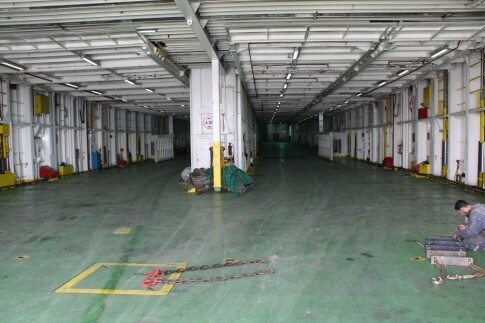 The former pizzeria is now a new crew mess. Forward on Deck 5, this area was the Show Bar as the Stena Hibernia and First Class on the Express Aphrodite. Moving up to Deck 6, the former self-service restaurant, The Pantry, has now become a reclining seat lounge. Aft of the former Pantry, the shop has also had seating installed. This area originally housed the ship's rather avant-guarde discotheque. 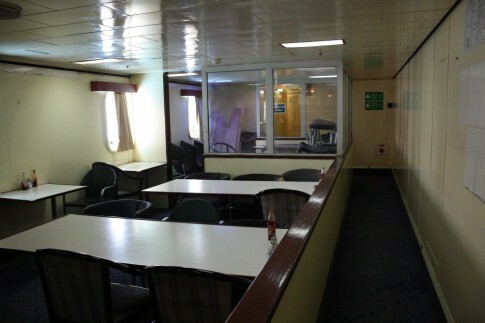 The old crew mess is virtually unchanged since the ship was built. ...whilst elsewhere reminders remain of even earlier times in the ship's career. Masarrah pictures Â© and courtesy Richard Seville. I read this with great interest! Thank you. 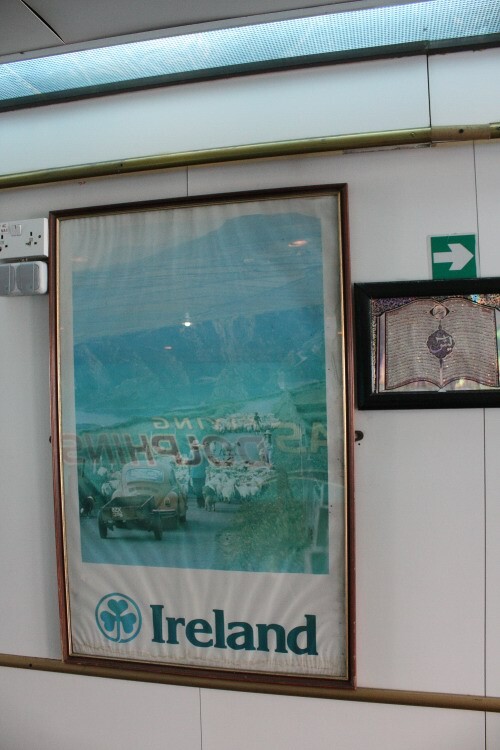 I remember this ship so well!Used to travel to Ireland once a year to see family. Were booked for Hss sailing in 1996 but it was not ready so along came the Stena Hibernia although I recall it was called Stena Adventurer in its last year with Stena? Although I now live in Plymouth I remember vividly 2 trips to/from Ireland on this ship, the first in 1979 as the St Columba and another trip when she was the Hibernia sometime in the 1990s. Great to see it is still active albeit thousands of miles away. I worked on the st columba for ten years,1979-1989.She was the best ship i ever worked on.It’s great to see the pictures as she is today.I would love to travel on her one more time. Sailed on the old girl for 13 years as Electrical Officer, 1984/1997, a fine well built ship. Grade 2 rating on the Hibernia/Adventurer 1995-1998, primarily working the wobblies shift in the shops. Great days. Some of the happiest days of my working life. Picture of the mess brought memories flooding back!!!! 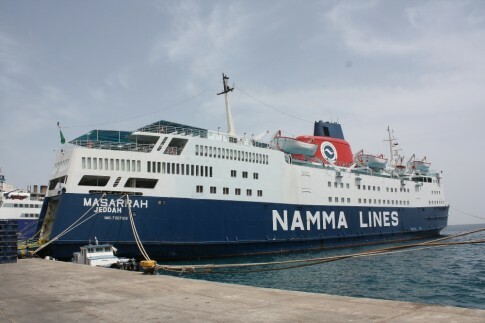 Get my maritime fix by going on cruises now and I’m sure I saw the old girl in Piraeus in 2003. Service years SHOULD read 1995-1997. Apologies for the typo!! and the crew great to see she’s still going. 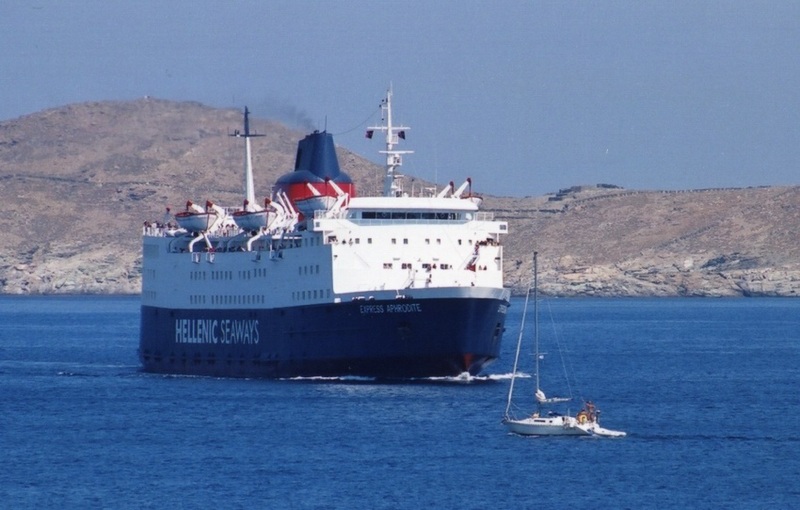 I spent 11 days aboard the ferry Express Aphrodite when she was sailing from Piraeus in the late 1990’s under the Agabitos flag. I photographed, thanks to Mr Agabitos,the complete ship from stem to stern and keel to funnel, some 1500 photographs. I am building the model at scale 1:50 in wood and use the photos to construct the interior as it was then. Stena Hibernia was a favourite of mine when I used to go to Ireland on business. I travelled on her many times. I was aboard her just two weeks before the famous roll-over business. My confidence in her was enhanced by the incident. I seem to recall that she didn’t generally roll much at all, but she would pitch. 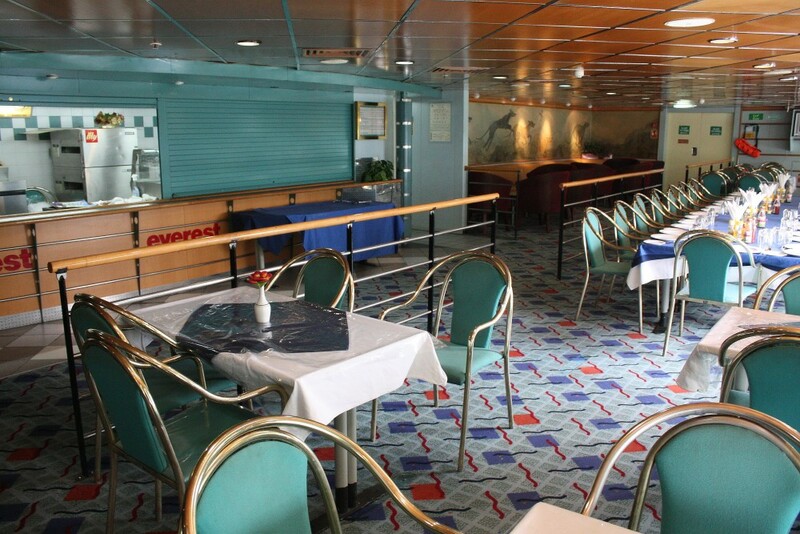 There were a few side facing seats which seemed to co-incide with the fulcrum, they were a blessing if you had partaken too much of the restaurant open buffet at the forward end. She was a proper ship shaped ship, in comparison to her travelling aboard the HSS was like travelling in a motorway service station. I missed her when she was withdrawn. Does any one know if she is still sailing as i plan to go to see her and take dome new photos for the site. i worked on herin the stores from 77 to her end, great ship. Travelled on St Columba many times between DL & HH! Is it possible her current owners would give her away for use as a permanent exhibition in Dun Laoghaire, rather than scrapping her? Anyone know if she is still working now? Be nice to see an updated photo of her. Sailed on her many times in the late 70s / early 80s for the annual family trip home to Ireland, and also sailed on her a couple of times in the 90s as both the Hibernia and Stena Adventurer. Top ship – great to know she’s still around. take pics for the site. Was on her every summer as a child. Looks like she’s still in service. I’d heard she’d suffered an engine room fire so severe that it had weakened her structure to the point where she couldn’t be used as a passenger vessel any more. I’ve since checked her status on Fleetmon (www.fleetmon.com) a few times over the last month or so and after weeks of inactivity moored up at Jeddah, she now seems to be sailing again between Jeddah and Sawakin (Sudan). Travelled on her as a kid 1978 on a 3 day tour of Wales with St.Michaels school we slept in the “Disco” but there was no music ! I had the princely sum of 3 pounds to spend on that trip. I often used to cross HolyHead to Dun Laoghaire and many times travelled the “Hibs” she was my favourite ship on that crossing. 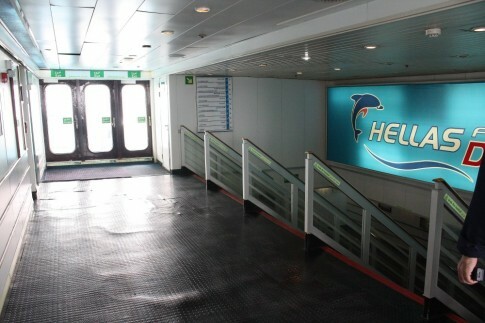 The smaller HS ferries unable to cope with the winter weather and the HSS was like travelling in a motorway service area. My habit was to travel over on the 2.00pm sailing (about) on a Monday and return on the late Thursday evening sailing which dumped us in Holyhead around haft past midnight. I could then drive to my home in the midlands and be home in bed by about 4.00am. I was on the ship about two weeks before she “rolled” in January 1993. My faith in the ship was enhanced by her perfomance on that occasion. The logitudinal bulkhead (for want of a better expression) I think saved her. The faster ships made the crossings quicker and more convenient timewise, but they were never “proper” ships. Hibs used to pitch but not roll too much after my meal in the forward restaurant, if the crossing was rough I knew exactly which seat to choose in the video lounge as being the closest to the fulcrum. Huge nostalgia looking at this article. Use to go to Wales every year as a family and sail from our home town of Dun Laoghaire to Holyhead. The St. Columba was always our favourite ship to sail on, much preferred it to other ships such as the St. David. My dad worked for Sealink all his life, he loved travelling on the ships and he had the best sea-legs of anybody I have ever seen – the ship could be pitching around all over the place and there would not be a bother on him! Very very happy memories of both him and this ship. Great to see that it’s still going strong – would love to see it again some day and show it to my own kids. Brings back memories st Columba brought me from ireland to england years and years ago worked on the Canary Wharf never wen’t back. They should send all old sealinks ships and I+B ships to Ireland so Irish people can walk around them one more time and take there kids see them. I was in alborg in Denmark when she was getting built..
Then sailed with her for about 14 years from Holyhead to Ireland.